Shop 4C Western Wear - Cowboy /Cowgirl - Hats, Boots, Flannels & More! 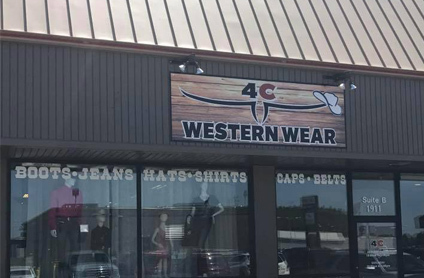 4C Western Wear sells Men’s, Women’s and Children’s Western clothing, footwear and accessories. Your one stop shop to all things country! Shop flannels, hats, jeans, and boots. Custom-made cowboy boots, moccasins and work boots are also available. Top brand boots from Twisted X, Justin, Dan Post, Durango, Johnny Ringo, Corral and many more! Products such as Mink oil, and waterproofing agents can be found in store. High quality products at affordable prices.